MyPartnerForever, a well-established Russian women dating agency, recently made their services more accessible for Portuguese men. As in most countries of Western Europe, an increasing number of men are seeking a life partner from Eastern Europe. MyPartnerForever, a company offering dating and matchmaking services, recently partnered with a well-established marriage agency in Vinnitsa, Ukraine. MyPartnerForever, a well-established company offering matchmaking services with single Russian women, has recently partnered with marriage agency Oksana located in Kiev, Ukraine. MyPartnerForever, a well-established company offering matchmaking services to men who are seeking a Ukrainian bride, have recently partnered with marriage agency Svetlana, located in Kharkov, Ukraine. My Partner Forever, a leader at providing dating and matchmaking services between men from the West and Eastern European women has recently partnered with a well-established marriage agency in Poltava, Ukraine. My Partner Forever, an international matchmaking service, now offers comprehensive and affordable services for dating single Ukrainian women form Horlivka, Ukraine. By combining their efforts with Marriage Agency Nataliya, they can provide their clients with a wide range of services. MyPartnerForever, a well-established marriage agency that specializes at creating couples between foreign men and Ukrainian women, recently partnered with an apartment rental company, based in Sevastopol, Ukraine. This new partnership enables their clients to travel without the worries of finding decent accommodation. 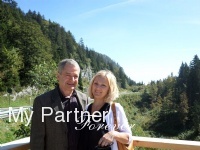 MyPartnerForever.com, a Russian women matchmaking service, recently translated their website in Norwegian to help men from Norway who use their services to find a Russian wife. My Partner Forever, an international matchmaking service that helps single men from around the world and single Ukrainian women to find each other, recently partnered with Ukrainian Brides Agency Tatiyana, located in Kherson, Ukraine. Their partnership enables them to offer a wide range of services, both for their local and international clients. My Partner Forever, an international marriage agency that specializes at introducing Eastern European women from Russia and FSU, recently partnered with Russian Brides Agency Alla, located in Samara, Russia. By combining their experience and services, they offer a scam free environment where their clients can easily and safely find a life partner.